With a request like that, I have to answer! The Photo Album feature lets you insert multiple images at once. It’s true that it always creates a new presentation and I don’t know why that is. But it’s SO easy to move those new slides to your original presentation. Choose Insert, Photo Album, New Photo Album. (In PowerPoint 2003, choose Insert, Picture, New Photo Album.) You see the Photo Album dialog box. Click the File/Disk button to choose the images that you want to insert. Navigate to the folder that contains the images. To insert many at once, click the first image file and scroll to the last image. Press the Shift key and click the last image. This selects all of the images between the first and last that you clicked. To select multiple specific images but not all of them, click the first image and then press the Ctrl key as you click another image; continue until you have selected all of the images you want. Click the Insert button. Note: At this point, you can repeat the previous step and add images from a different folder. In the Album Layout section, choose a layout from the Picture Layout drop-down list. Fit to slide will do its best to cover the entire slide, but without distorting the image.. You can also put 2 or 4 images on a slide and you can add space for a title. If you choose any layout except Fit to Slide, you have an option for a frame shape. such as a rounded rectangle. Choose the option you want from the Frame Shape drop-down list. Click Create. PowerPoint creates a new presentation file with your images formatted as you specified. For some reason the slide background is black, at least in PowerPoint 2013, where I’m testing these steps. To change the background color, select all of the slides in the left-hand pane. (Use the same Shift key method I explained above.) 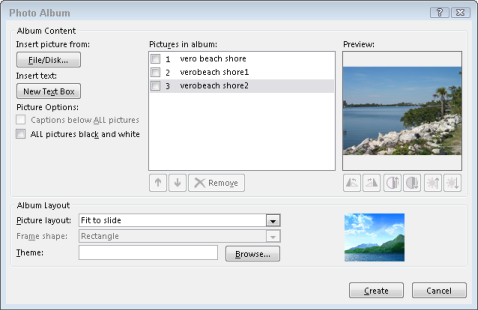 Then right-click one of the selected slides and choose Format Background. Choose the color you want from the Color drop-down list. If you want to save this new presentation, do so now. However, if you just want to copy the slides to an existing presentation, you don’t need to save the photo album. In the left-hand pane, select the slides. The first slide is a simple slide that says “Photo Album.” You probably don’t want that slide, so just select the rest of the slides. Copy to the Clipboard. You can press Ctrl + C or right-click a slide and choose Copy. Open or display the existing presentation. In the left-hand pane, click where you want the new slides to go. Paste from the Clipboard. You can press Ctrl + V or right-click and choose Paste. 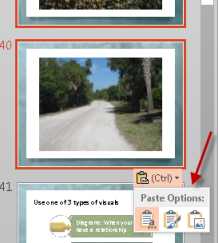 Notice the Paste Options icon at the bottom of the pasted slides. (See the red arrow to the right.) You can click its down arrow to display options. These look somewhat different in different versions of PowerPoint, but they allow you to use the destination theme / formatting (the default, so that all of the slides look like they belong in the same presentation), use source formatting, or paste an image of the slide. If you want to change the default option, choose it from the list. You may have to do some manual formatting on each slide, but this method will certainly save you time compared to inserting images slide by slide by slide! Do you sometimes need to import a number of images into an existing presentation? Have you used the Photo Album feature? Leave a comment and share your experience and techniques! Head slap!! Do I ever wish I had known about the photo album feature a long time ago. Can’t tell you how much time I have spent uploading individual photos. Thank you for this tip, Ellen. Dona, Glad to help! I know, when you don’t know that a feature exists, it’s hard to look for it. I suppose that a good rule of thumb is that if you’re spending a huge amount of time doing something, there’s probably a quicker way. As the reader seems to have a photo album then with it open you can add to it by editing the photo album. It’s on the same insert photo album menu but you need to click on the downward arrow and select Edit photo album. Then you can add the images and click update. There are so many time-savers built in to PPT. Too bad I don’t more time to look for them, but am I glad you are willing to share them. Ellen, you are a lifesaver! I made the extra photos into a simple 2003 PowerPoint, copied them, then pasted them into the Photo Album thus completing my presentation. I did the same with 2010 version and it also works. I don’t know if PowerPoint has an absolute limit, but mostly it will depend on the memory of your computer and your video card/driver. 3200 sounds like trouble to me. You might want to divide it up into multiple presentations and link from one to the other. Here’s one way to do that: http://www.ellenfinkelstein.com/pptblog/link-to-other-presentations-and-return-to-the-original-presentation/. I made a template to fit what I’m importing. I made it portrait. PowerPoint made them landscape. how do i make it stay portrait? hi I know that this is a bit old BUT I want to import from an album as a background in an existing pres with slide text and speaker notes all in place – the pictures go with each slide in order – this method inserts and moves all existing slides to the end of the inserts – is there a way? Hi, thanks so much for this, spent hours trying to import a set of pictures as a part of an existing PP. So, now I have my nine new slides with their pictures, can I layer them? So that I Have one page that people can click into if they want to see all the photos?